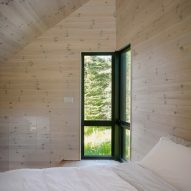 Montreal architect Anik Péloquin has built an angular extension to a quaint cottage in Canada, with an off-kilter roof and white-washed interiors. The project titled The Sisters, or Les Soeurs in French, involved creating more space for a Canadian house built in the 1930s. 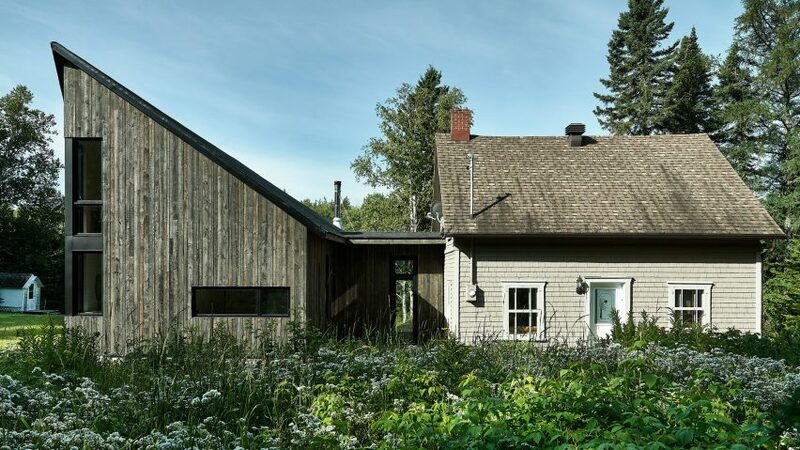 The owners purchased the cottage six years ago, and lived there for a while before deciding how to renovate the site to best suit their needs. The addition is scaled to match the main cottage, with low walls on the west and south sides relating to the shorter stature of the original structure. 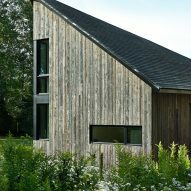 Clad in dark tamarack wood laid vertically, the exterior contrasts the horizontal bands of light-toned shingles on the older building. A narrow outdoor deck wraps around the perimeter and joins the main house, with steps leading down to nearby marshlands and water. "The project is a reflection on the integration of a new building into a natural setting," said Péloquin. "It is not intended to dominate the landscape, but to be a part of it." 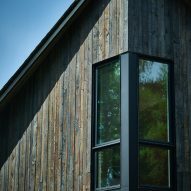 Despite looking contemporary, with large windows and stark black roof, the addition is intended to be and complement its neighbour. 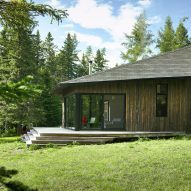 The cottage is located in La Malbaie, a small town up the Saint Lawrence River from Quebec City. For three decades, it was first used as a hunting lodge and then became a summer home for the Sisters of Charity – a religious organisation of women that assisted in education, nursing and serving the poor. "The existing house would remain standing as the 'big sister' bearing witness to the history of the place," said the architect. "It would become a bunkhouse for guests." 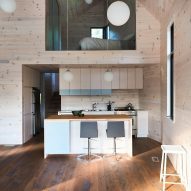 Inside the extension, walls are covered in white-stained pine, while wooden floors are coloured warmer to add a cozy feel to the pared-down interiors. A living area on the ground floor has a small kitchen with a cooktop and sink, and an island that overlooks a main lounge area with a sofa, dining table and fireplace. Large, sliding glass doors and glazed walls overlook the water, and milky glass lighting hangs overhead. The extension's pointy roof provides additional living space, making space for a lofted section above the kitchen. A queen bed and closet occupy the mezzanine, which is partially exposed to the downstairs area through a glazed half wall. "To the east and north, the roof rises steeply to the ridge board, more than 25 feet off the ground, echoing the surrounding trees and a church steeple, evoking the site's history," said the architect. Photography is by Louis Prud'homme.